Stephen Miller over at GreaterGreaterWashington is reporting that DDOT is moving the previously-planned cycle track along I Street to M Street. 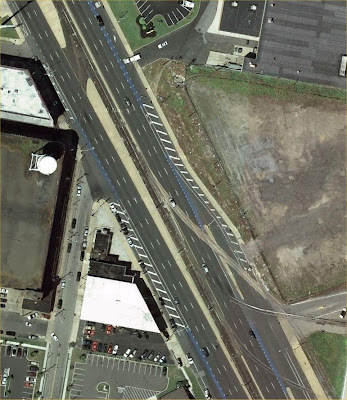 Amongst other reasons, this was done since an M Street track would have less traffic impact, allows for potential bus improvements along I Street (to be studied with WMATA), is only one block from the planned eastbound cycle track on L Street, and provides better bicycle connectivity in the long run. These are on Columbus Blvd in Philadelphia. The blue paint was used where the bike lanes were crossing other traffic areas. They're going in! (photos by Eric Gilliland). I should take a trip up there soon myself. Alas, one part of the earlier bike lane plan is a no-go: the Commission of Fine Arts pulled the plug on painting the bike lanes green.